Target Circle allows you to mass validate the transaction of your Advertisers. 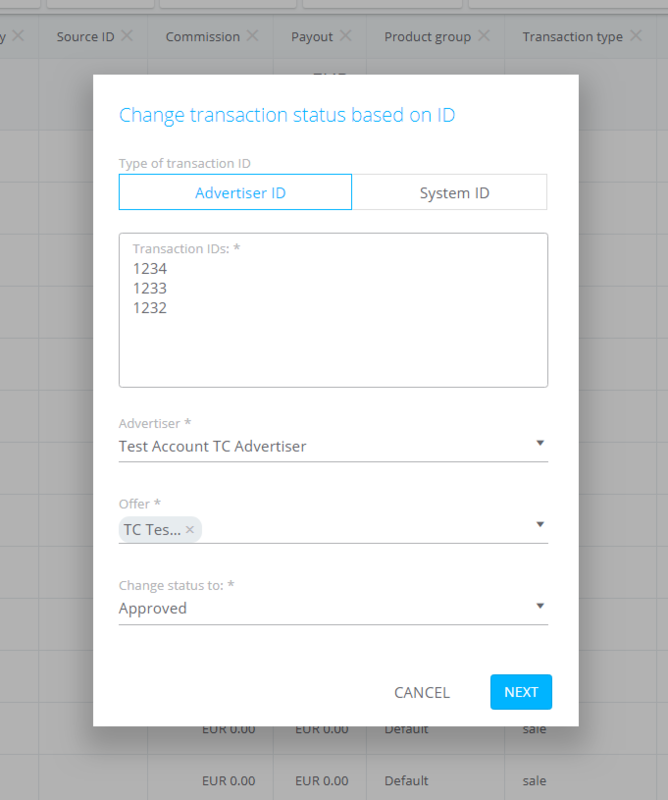 For this purpose you can either use the Transaction ID (Advertiser) or the Transaction ID (System) . The Transaction ID (System) is our unique, internal system ID that is allocated to your transaction by Target Circle. To start with the validation you have to click on VALIDATE TRANSACTIONS in the header of your transaction report. Once you click on the icon a modal will appear on your screen. For mass validation with Advertiser IDs you have to click on Advertiser ID . Then you have to paste the IDs in the Transaction IDs field. All transaction have to be separated by a line break. 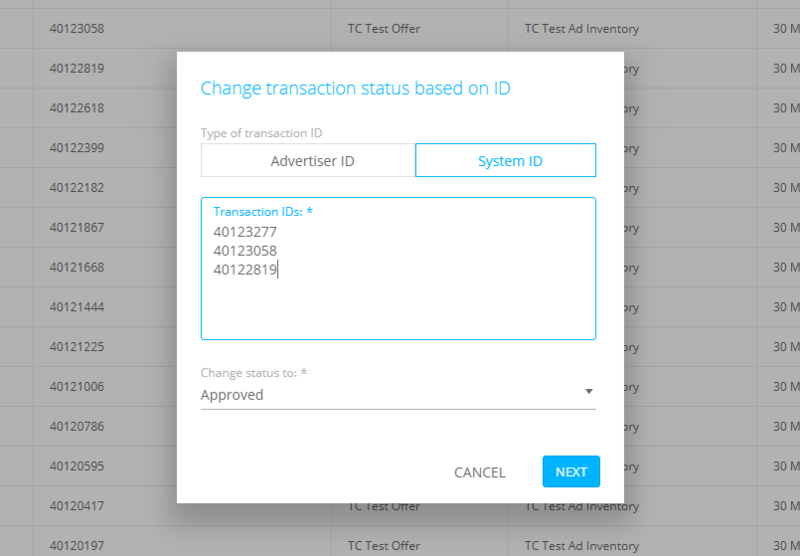 Next you have to select the Advertiser and the Offer the transactions belong to and the new transaction status. You can choose between pending , declined , approved , approved, invoiced , approved, paid in and approved, paid out . For declining transactions you also have to select the reason. To proceed with the validation you have to click on NEXT. For validations with System IDs the process is almost the same. The only difference is that you don´t need to select an offer. Clicking on NEXT will trigger a new modal to be opened. Here you can see a preview of the total number of transactions of which the statuses are being changed by your mass validation. 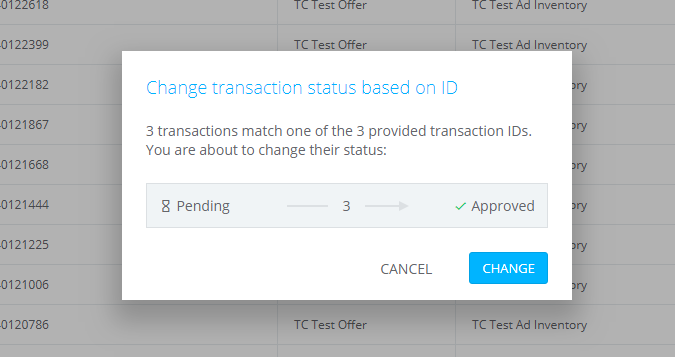 You can also see the old and the new transaction status of the transactions. Please note: In case you are validating a large amount of transactions (1000+) it can take several minutes before the transaction report is reflecting the changes.